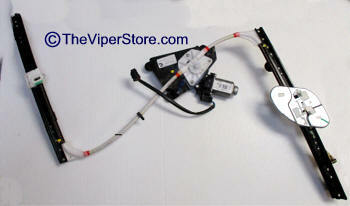 Dodge factory Door window regulator unit. Includes the motor. Left or drivers side unit complete. Stainless Steel Kit - will never rust! A Fix! This kit or service can either fix and strengthen your broken window regulator (works for passenger and drivers side) or put it on one you are buying or your existing window regulator and it will many last years longer. Prowler window door regulators often fail because of a design flaw in the track line. About 90% of the time a crack will appear along the long white plastic PVC lining (along the track line) pictured circled in red in the photo to the right. If this failure happens to you it is fixable. **Guarantee. However not only do we have a repair kit that will fix this most common problem - once installed as directed it will fix and not break along the track line again for as long as you own your car or we will provide another repair kit at no cost to you. 1. Repair Kit alone. Includes all the parts necessary for repair, stainless steel braces, screws, white electrical tape. 2. Repair Kit with special tools. Includes repair kit above plus the two special tools needed to make the repair much easier. **We highly recommend this option. causes the door window to bind and jam. 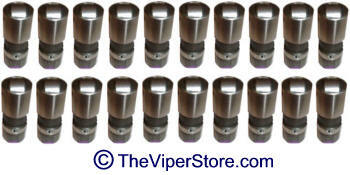 Dodge Factory Performance Hydraulic Roller lifters allow for more valve lift and are a great compliment to our performance camshafts when used on 2000 and newer Viper engines. All Dodge Viper engines come with hydraulic roller lifters, The 2000 and newer engines feature what are referred to as "fast bleed" lifters. The fast bleed reduces lift although makes for a smoother idle. This is not necessarily desirable for high performance applications. 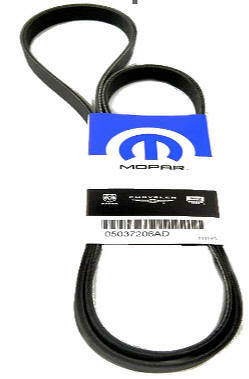 These factory Mopar lifters are what are used in all 1992-1999 engines. With their slow bleed design, more lift is delivered at the valve, increasing power accordingly. 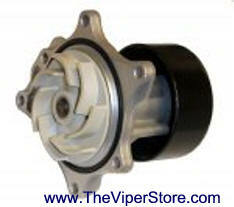 Best used on any 2000 - 2006 Viper engine as well. 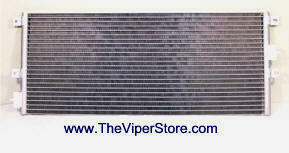 Factory original air conditioning condenser.